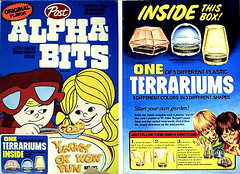 One of my earliest gardening memories was getting one of these terrariums in my Alpha-bits cereal. I had the yellow one on the right. Our neighbor had the middle one. I asked her if I can have it, but she wanted to keep hers. This entry was posted in Uncategorized and tagged memories, terrarium. Bookmark the permalink.